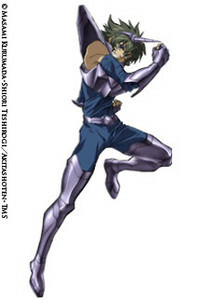 This article comprises a list of characters of the manga Saint Seiya: The Lost Canvas by Shiori Teshirogi. The names of Athena's Saints include their constellations, and Hades' Specters include their destiny stars, being in both cases the last one their real names. As some of the characters appear only in this derivative work and not in Masami Kurumada's original manga, their canonicity within the universe of Kurumada's work is still unrevealed. Pegasus Tenma (天馬星座のテンマ, Pegasasu no Tenma?) is the Pegasus Bronze Saint in Lost Canvas. He's the protagonist of the series, an orphan of Japanese ancestry, later revealed to be son of Mephistopheles Yōma. His soul reincarnates every time Athena returns to Earth, since the mythical ages of Greece, as the destiny of the Pegasus Saint is to forever be at his goddess' side, since he wields the strength to murder gods. His shown fighting techniques are Pegasus Meteor Fist (ペガサス流星拳, Pegasasu Ryūseiken?) -- a shower of punches at supersonic-speeds. He can also concentrate the diffuse strength of the punches into one concentrated blow called Pegasus Comet Fist (ペガサス彗星拳, Pegasasu Suiseiken?). In his fight against Virgo Asmita Tenma briefly awakens the Seventh Sense, allowing him to fight on the same level as the Gold Saints. After returning from the Underworld, his Pegasus Cloth is repaired with the blood of Virgo Asmita, turning it into an identical version to the one that Pegasus Seiya wore during the Hades Arc from Kurumada's original manga. He is currently running through the Demonic Temples of the Lost Canvas, in order to get to Alone. Having reached the Saturnus Temple, Tenma is engaged in battle by his mother Partita, who is revealed to be a Specter of Hades' army. Tenma engages his mother in battle, and pushed by her to the limit, Tenma's Cosmo awakens to the Seventh Sense, causing the Pegasus Cloth to turn golden hued, due to Virgo Asmita's blood, and acquires a new appearance. Despite this, the Pegasus Cloth is completely shattered by Owl Partita, and she extracts Tenma's soul, which resembles Pegasus in appearance. Both struggle for possession of the soul, Tenma managing to retrieve it pulling from one of its wings, reintegrating the soul to his body, at the cost of a grave wound. A spiritual feather falls off the wing, touching the blood-smeared shards of the Pegasus Cloth, causing the resurrection of the Pegasus God Cloth, which envelops Tenma's body. He engages his mother in a final effort, and she is promptly defeated. Before she dies, Tenma and Partita reminisce about their pasts. Tenma recuperates and after Pandora reveals Alone is alive, he parts to encounter him. During the trek to Alone, Tenma re-encounters his father Yōma, but their meeting is cut short by the return of Gemini Aspros.